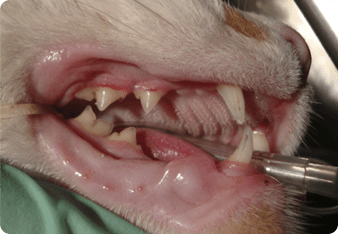 Periodontal disease is the most common issue affecting cats’ health today. Cat’s teeth accumulate plaque and tartar, just like ours. If not properly treated, this can lead to more serious issues such as pain, gingivitis, tooth decay, bone loss and even long term systemic consequences such as kidney or heart disease. If your cat has bad breath, changes in eating habits, red, swollen or bleeding gums, this may indicate dental disease. Regular dental care can prevent disease and discomfort, while adding years to your cat’s life! Under anesthesia, your cat will be monitored using state of the art equipment. The doctor will perform a full oral exam and a technician will clean your cat’s teeth to remove plaque and tartar buildup. After cleaning, polish will be applied to smooth the surface of the teeth. This helps to prevent bacteria from adhering to the teeth. Full dental radiographs are taken to view any issues below the gum line. Often times a tooth may look healthy but the roots have begun to decay. If extractions are indicated, they are performed by the doctor. There are a number of diets and home care products specifically formulated to help clean your cat’s teeth. Many cats even comply with regular tooth brushing.